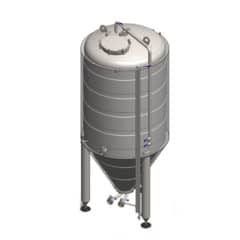 The CIP 503 is used for sanitation and sterilization of vessels and piping routes in the brewery. 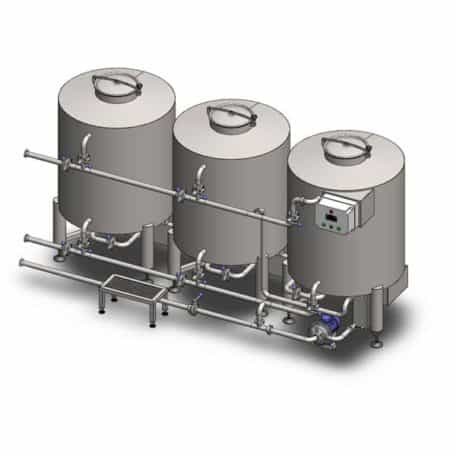 The CIP equipment provides heating and circulation of alkaline or acidic solution trough sanitary shower that sprays sanitary solution on the wall of a vessel.The device consists of three separate containers with a nominal volume of 500 liters and one neutralization vessel (150 l) and an installation of pipes. 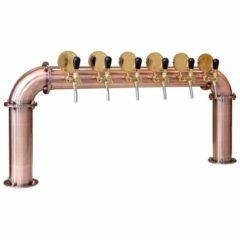 The CIP device consists also of a pipe heat exchanger (the heating by hot steam using an external hot steam generator) with a digital temperature control in range of 0-80 °C. 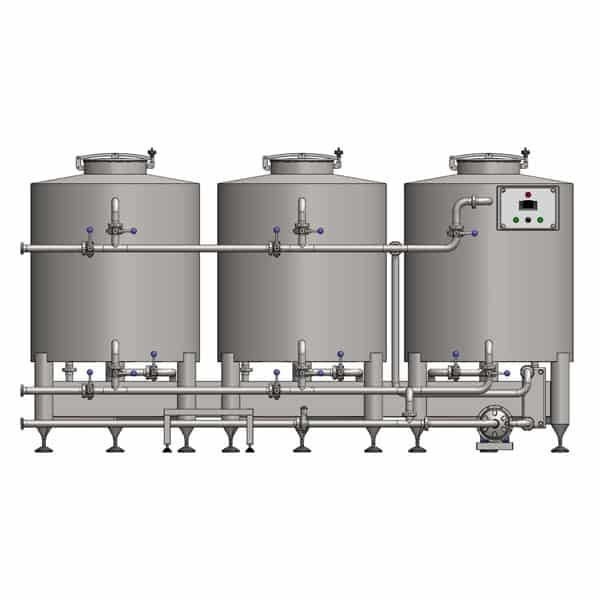 This type of the CIP station is recommended for cleaning and sanitation of tanks with a volume more than 6000 liters. S : Steam version – The heating has to be ensured using an external hot steam generator that is not included in the price. E : Electric version – The heating is ensured using an internal electric heating elements that are included in the price. The equipment CIP-503 is installed in a rigid frame provided by lockable wheels. Used material is stainless steel 1.4301 (AISI 304) or 1.4404 (AISI 316) according of selected variant. Containers (vessels) are not insulated. Pre-rinse – rinsing the production equipment using cold or hot water. 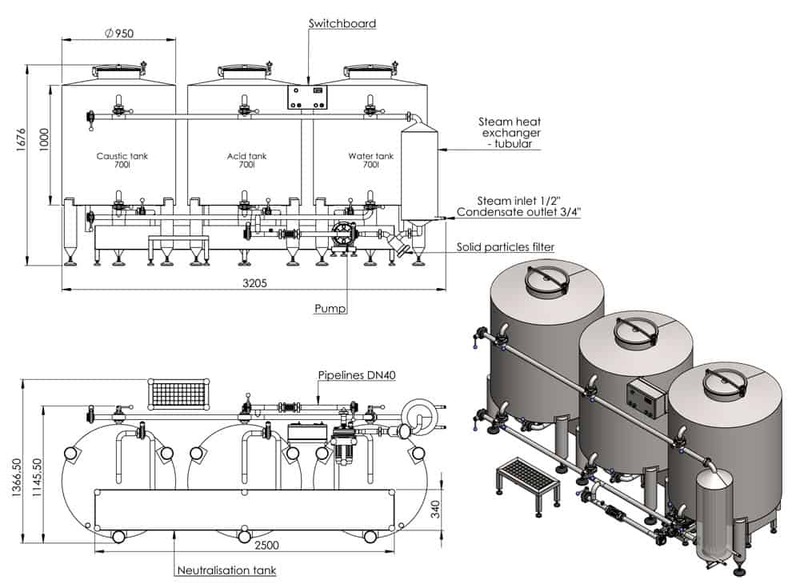 Cleaning – cleaning the production equipment using circulating hot water. 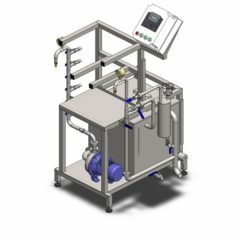 Rinse – a proper rinse of the production equipment using cold or hot water. 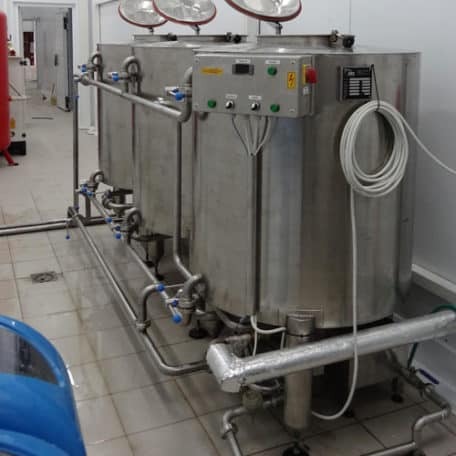 Chemical disinfection (sanitation) – washing the technology using alkaline and then acidic sanitizing solution at the desired concentration. 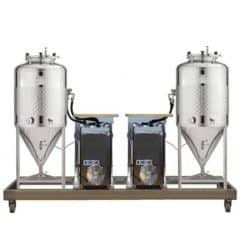 Neutralization – is performed after a termination of several cleaning and sanitizing cycles – it mixes alkaline and then acidic sanitizing solution to achieve a neutral pH of the solution and then releases them into to the drain. 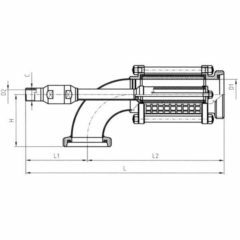 Version CIP-503-304 : Pump inner parts and heating chambers are made from stainless steel AISI 316. Pipes, fittings, frame and tanks are made from stainless steel AISI 304. Version CIP-503-316 : All parts are made from stainless steel AISI 316. 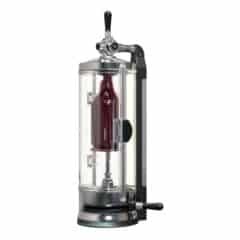 The secondary pump is necessary in the systems with big tanks and long pipes to be sanitized with the CIP station. 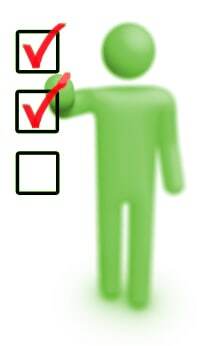 Contact us for decision if the secondary pump is needed for your system. 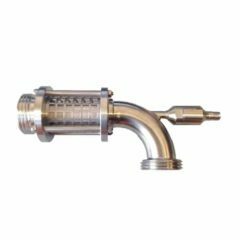 The function of the secondary pump is the suction of used solutions back from the sanitized system into the CIP station for next use. 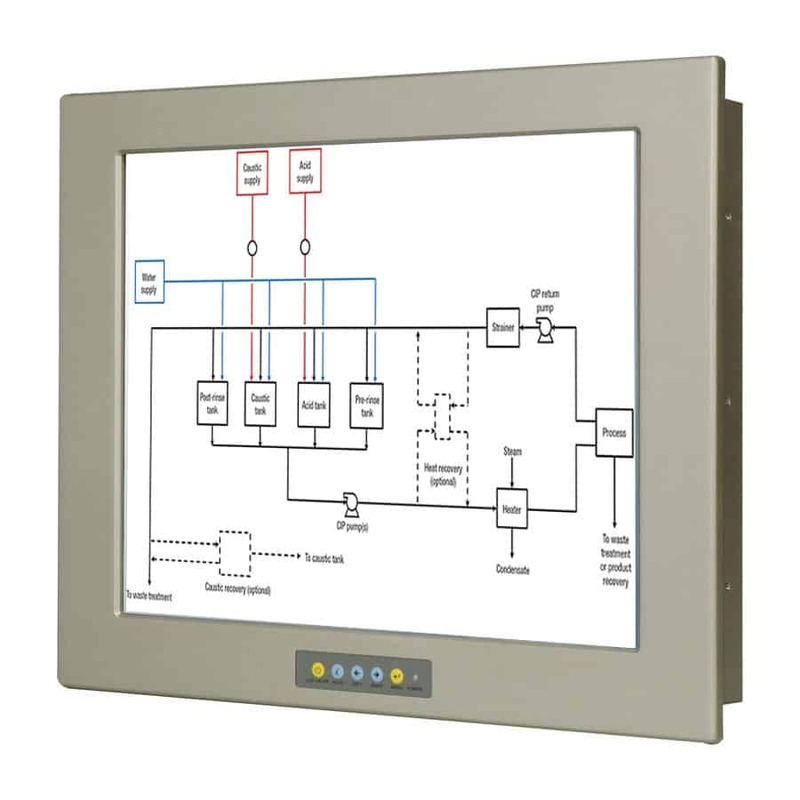 CIP-AUT3 is an automatic control system for the Cleaning In Place system CIP-503. 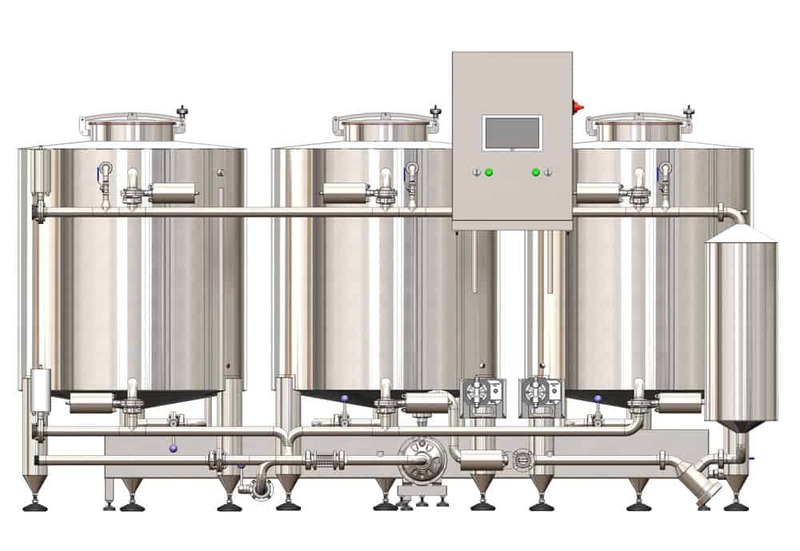 The automatization includes all functions necessary to perfect cleaning and sanitation of all containers and pipes in the brewery using a special program, sensors, pneumatic valves and industrial computer with the touch display. 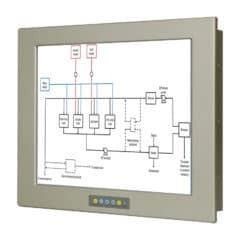 This control system is compatible with the CIP-503 equipment. 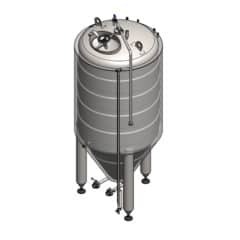 Why to use the CIP for cleaning and sanitation of the brewery equipment ? 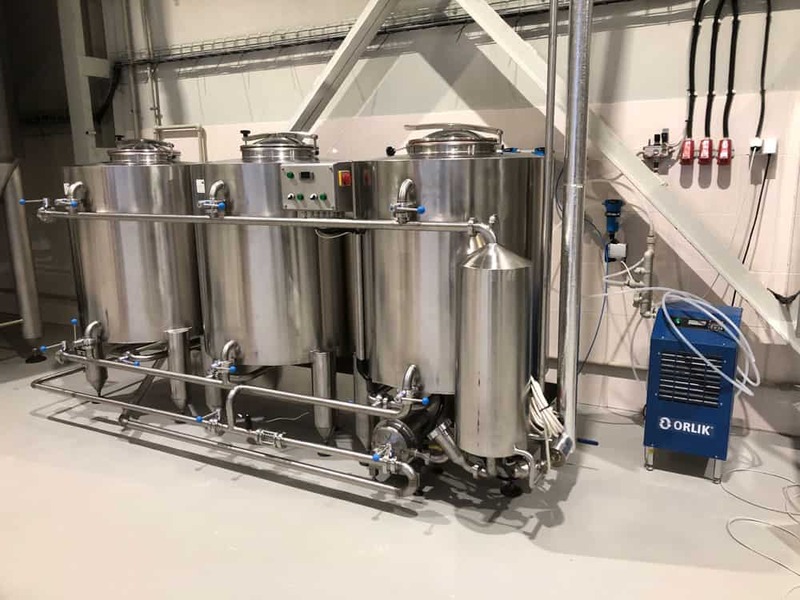 Saves preliminary work: Sanitizing solutions are always prepared in the CIP containers and they are available in a desired dilution for several cleaning and sanitizing cycles. Their preparation before each cleaning and sanitizing cycle is not needed. 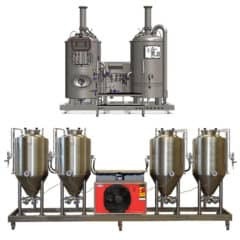 Increases work safety: Limiting the frequency of sanitizing solution preparations reduces the chance of burn of the operator while handling with the concentrated acids and alkalies. 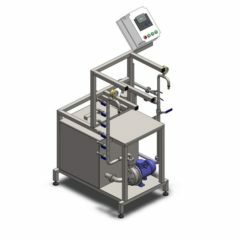 Saves time and energy needed for cleaning and sanitizing: A continual heating of cleaning and sanitizing solution during the cleaning and sanitation cycles and keeping them at a prescribed temperature increases considerably the efficiency of cleaning and sanitation, it leads to a time-saving service of the equipment and electricity – the cleaning process and the operations of pumps take significantly less time. 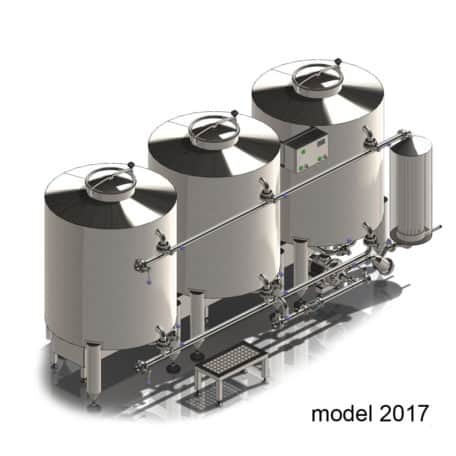 High efficiency of cleaning and sanitation: Compared to the sanitation carried out by a simple circulation pump – while using the CIP unit there is still the same temperature of the sanitizing solution during the whole CIP cycle. 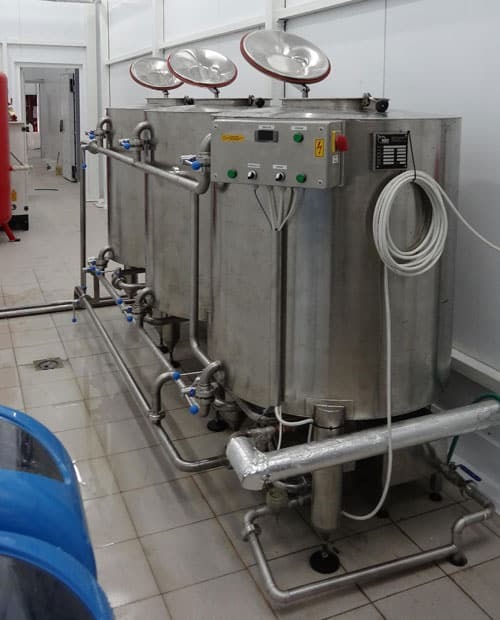 Cleaning and sanitation, which is carried out by hot solutions is definitely more effective than the same process arranged by cold solutions, and therefore, the vessels and the equipment are perfectly clean after sanitizing and washing cycle and they also get rid off organic and other dirt, which is in the brewing operations an essential condition for the hygienic requirements. 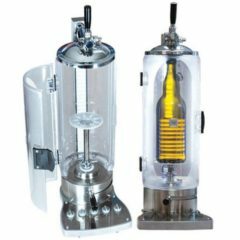 Simple neutralization of acids and alkalies after by using: The neutralizing vessel (a part of the CIP station) allows easily, safely and completely neutralization of used acidic and alkaline sanitizing solution before pouring into the channel. It fully complies the requirements of law to protect the environment and prevents damages which may happen to drain systems and other components. Furthermore, it increases the safety while handling with the solution or when washing or sanitizing. The price is valid for all countries of the European Union. The price includes two day work of two our specialists in the place – assembling and start up of the CIP. The price does not include : transports costs and accomodation of the workers. Will becalculated individualy. Instructing of the customer to use and control the station. This work is included only if the customer is present in the production factory prior to expedition the device. Instructing of the customer to use and control the station on the installtion place.